The following aren't actually tricks. They are exercises that you demonstrate once to show a deeper truth. Most will not work on people a second time. Some will learn to game it. Most of my favorites I will not describe here. Not just to tease you. One of the things about tricks is that when you read about them you think that you understand and you may not fall for that particular trick . . . but the underlying weakness is still there and you are still vulnerable. You must first pick a demonstration partner. I prefer someone I don't know, who has excellent breakfall skills and preferably the best-known or most experienced martial artist available. I take him in front of the class, turn so that we are both facing the students shoulder to shoulder and ask him to introduce himself to the class. When he starts talking, I turn suddenly and fire a flurry of punches (noncontact) at his face, sweep his legs out from under him and continue the flurry on the ground, stopping when he unfreezes and starts to react. What is going on in the demo: This is how bad guys set up assaults. They get position first. Then they get the victim distracted. Then the threat attacks full out—no defense, no feinting or sparring. Even without contact it works reliably because it spikes the victim's OODA loop. Each fist coming at the victim's face is an observation, a piece of information. If the victim can't orient, decide and act before the next fist comes in, (the new observation) the loop resets. In other words, unless you have conditioned yourself to act when overwhelmed, fast fists freeze you. Even when they don't hit. The purpose of the demonstration is partially to show how bad guys attack. The set-up, the explosiveness. 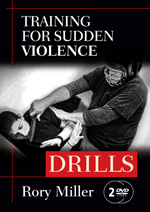 It is largely to show that almost everything most martial artists have learned about timing and distancing was never intended for assault survival and doesn't work there. I call this the touchstone and it is only a piece. For surviving sudden violence, this is the touchstone—fast, unexpected, from the flank or behind. Overwhelming speed and damage. Designed to freeze your mind, hurt your body and break your will. And there is still a piece missing from the demo. The bad guy is not going to pick the martial artist who moves best in the whole class. He's going to pick you when you are tired or injured. He will pick the old and the small. T2: "Hit me as hard as you can." This one requires immense judgment. You need to be able to read people well. It will not work for you if you have a certain reputation. This is early in your career stuff. The demo is simple. You hand someone a club and tell them to hit you in the head as hard as they can. Then you do nothing. You do not move. Most will wind up, swing, and when they see you not moving, do everything in their power to stop the strike. One of the people I used for this strained a muscle in his back stopping. This is, obviously, not a safe demo. There are certain people who won't stop, but they are rarer than I think they should be. Anti-social personality disorders; people even mildly on the autism spectrum; and people with serious exposure to weapon violence will probably follow through. Everyone will follow through if you have a reputation for having a lot of nifty moves. Hence, this is only something you can do with new students or early in your career. This was one of the core aspects of my jujutsu kata training. We were expected to wait in stillness under a committed attack until the point where the uke could not shift or change. The primary purpose of that aspect of training, for us, was to be able to slow time and then move explosively. One of the side benefits is that you got very good at reading who would follow through and who would pull. The purpose of the demo is what I call "glitch hunting." Everyone has some issues with using force on another human. Many people that think they are ready to hit a man in the head with a stick are not. This shows that. In the debrief, the point to emphasize is that this was not a conscious decision not to hit. This was all of your conditioning taking over in mid-swing. It can really screw you up when and if you need to take someone out. This is a parlor trick. No more. It is something that you do to demonstrate how much the mind can be influenced to control the body and how powerful communication is. Most fights are social violence and they are all about sending messages. You need one physical skill: the ability to snap your fingers with either hand. I only demonstrate this on any given individual once, but I am not sure that is necessary. And I avoid Anti-Social Personality Disorders, people on the autism spectrum or those who have a history of dedicated, professional unarmed violence. People who don't blink often is one of the clues to the first two. Anti-Socials are wired to not care about people and thus miss a lot of the subconscious communication. People on the autism spectrum miss almost all subtle communication. Professionals (not all, but ideally) will make the decision and act despite cues. Using your mirror-side hand (your left hand if he is punching with his right, your right if he is punching with your left) at chest level, snap your fingers and point to the side. His fist will follow the point and he will miss you. This is not a combat skill or magic or useful in a real fight. The purpose is to show the students some of their own internal wiring. We are communicating animals. We follow instructions, sometimes even when it is not in our best interest. If a trained striker will miss when he is subtly instructed to, what are the odds that he will freeze if someone yells "FREEZE!"? How many grapplers will reflexively release pressure when the other guy taps, even if it isn't a game? And some of those tricks, especially combining communication with your physical skills can be useful. 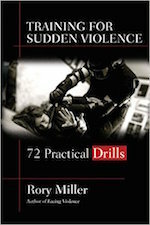 The above is an excerpt from Training for Sudden Violence: 72 Practical Drills by Rory Miller.